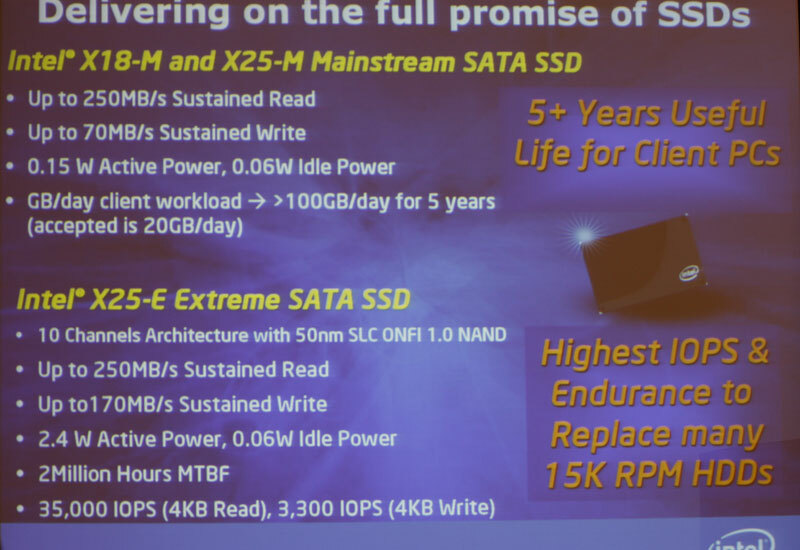 During a briefing at IDF this morning, Intel has started to outline its plans for deploying Intel Solid-State Drives to the market en-masse. There will be two different options that are designed to cater for different markets and each option has a slightly different schedule for deployment to the market. The higher-performance model, the Intel X25-E Extreme SATA Solid State Drive, will come in two capacities—32GB and 64GB—in a 2.5in form factor and is targeted at servers and high-performance computing markets. It is based on Single-Level Cell NAND Flash Memory technology and uses a ten parallel channel architecture. This enables some incredible performance, with sustained read and write speeds of up to 250MB/sec and 170MB/sec respectively. Read latency is an impressive 75 microseconds, while Intel claims that the drive can deliver approximately 35,000 IOPS when reading and 3,300 IOPS when writing with 4KB blocks. Power consumption is also pretty good too, with peak power usage quoted at 2.4W and typical idle power drain quoted at 0.06W. The Intel Mainstream SATA Solid State Drives come in both 1.8 and 2.5in form factors (and are known as the X18-M and X25-M respectively); they’re based on Multi-Level Cell NAND Flash Memory using the same ten parallel channel architecture as the SLC-based Extreme drives. As a result of this, Intel is able to increase the storage capacities up to 80GB and 160GB. However, because the mainstream drives use the slower Multi-Level Cell NAND technology in order to keep costs more reasonable, performance isn’t quite as good. Read speeds are still rated at up to 250MB/sec, while the sequential write speed has taken a hit – it delivers just 70MB/sec, or half the throughput of the X25-E.
Read latency has also dropped to a still impressive 85 microseconds, but the good thing is that this has resulted in a reduction in power consumption. With a typical PC load, Intel claims that the drives will use just 0.15W of power at load, while idle power consumption remains at 0.06W. This, Intel claims, will result in up to 30 minutes of extra battery life—along with higher system performance—in notebooks. 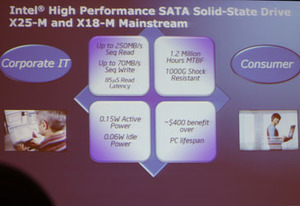 Intel also talked briefly about MTBF and also why its drives are 'better by design'. The X25-E's MTBF is rated at two million hours, while the mainstream X25-M and X18-M models are rated at 1.2 million hours. Intel said it achieved these high MTBF values with its Advanced Dynamic Wear Levelling technology, which is designed to smooth the IO load across the drive's ten NAND chips for higher reliability and longevity. In addition, Intel says that there is an extremely low Write Amplification Factor, which basically means the drives are able to deliver higher performance (with both SLC and MLC NAND flash) and also improve the drive's lifetime. Availability of the drives is staggered, with the first drives being the 80GB X25-M and X18-M – both will enter volume production within 30 days, says Intel. The next drive to hit the market will be the X25-E 32GB drive, which Intel expects to enter volume production in the next 90 days. Finally, both the 160GB version of the mainstream drives and the 64GB X25-E are expected to start shipping in early 2009. 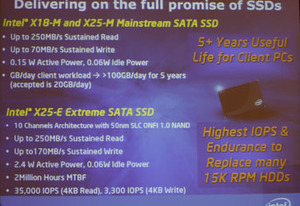 Are you excited by the prospects served up by Intel’s SSD drives? Tell us in the forums.